Imagine a street where you’d feel comfortable letting your 8-year old son ride a bike with his 80-year old grandma. That’s a complete street. Complete Streets are safe for people of all ages and abilities and serve people traveling in all different ways: walking, biking, taking transit, or just enjoying the street as a public space. Complete Streets – streets designed for all road users, including people on foot, on bike or taking transit – can help address transportation and public health problems in St. Petersburg. Infrastructure improvements like more visible crosswalks and protected bike lanes can make St. Pete’s streets safer and encourage more people to walk and bike. Many streets in St. Petersburg were designed for the fast movement of cars instead of the safe movement of people, with profound implications for residents’ health, according to a new report from the Florida Consumer Action Network Foundation and Frontier Group. The report, made possible by the Foundation for a Healthy St. Petersburg, details how changes in street design could improve health and safety across the city. FCAN organizer leads Complete Streets bike ride. With a new grant from the Foundation for a Healthy St. Petersburg, FCAN Foundation will start its Complete Streets project in July 2016. FCAN Foundation is among 19 groups in the inaugural $3.9 million grant awards by the new Foundation for a Healthy St. Petersburg. The Foundation was formed as a result of the sale of the Bayfront Medical Center. The Foundation says the grants are a “component of a multi-prong, multi-year, multi-focused strategy to improve health outcomes for the population of Pinellas County south of Ulmerton Road and east of Seminole Boulevard. Complete Streets and will improve the ability of the residents of St Pete to sustain healthy lifestyles through the implementation of a sustainable healthy transit initiative and adoption of healthy lifestyles. FCANF will be working with the City to implement the Complete Streets program. The city wants to provide transportation options for all citizens that will increase the levels of bicycling and walking and reduce the percentage of automobile trips. FCANF’s community Complete Streets project will conduct a resident survey to identify what people want and don’t want from their street grid and to build awareness of the opportunities created by the city’s Complete Streets program. We will organize community forums, where urban planners will present options and residents and stakeholders will be able to provide public comment. Additionally, FCANF staff will make presentations to neighborhood, business and professional associations and create awareness through social media. 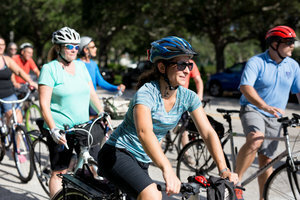 Through this outreach, we will build a St. Petersburg Complete Streets Visioning Coalition that will include community stakeholders including local chambers of commerce, healthcare professionals, cyclists, schools, retirees, law enforcement officials, neighborhood associations, the sustainability council and elected officials. The Board and staff of FCAN Foundation thank the Foundation for a Healthy St. Petersburg. Complete Streets increase safety for all users. In New York City, adding physically separated bike lanes to major streets reduced injuries to everyone- not just bicyclists- by 40 percent or more. We need to build sidewalks and protected bike lanes on major streets throughout St. Petersburg and reduce speed to save lives. Complete Streets improve everyone’s health by making it easier and safer to be active. Walking and biking attack health challenges like diabetes and heart disease. Neighborhoods with poor health outcomes are also those with the least complete transportation networks, making Complete Streets a critical health equity tool. Complete Streets are good for business. Not long ago, Central Avenue had little pedestrian activity, many boarded-up storefronts, petty crime, and frequent speeding. Small changes like crosswalks and bike parking turned this street around and it’s now one of our most vibrant commercial streets. Walking is the most basic form of transportation. 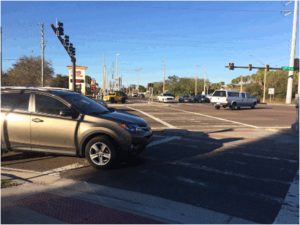 People walk and use mobility devices like wheelchairs every day to meet their needs in St. Pete, but not all our streets were designed to support walking. 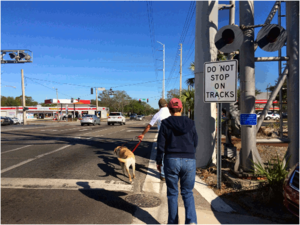 To find out how our streets are doing, we conducted Walk Audits. 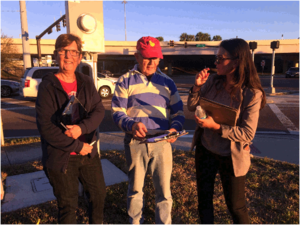 FCAN volunteers conducted walk audits of 18th Avenue South, the Skyway Marina District, and 28th Street North. Walk audits are a fun way to evaluate streets in St. Petersburg and identify changes needed to make them Complete Streets. Complete Streets can improve health, save lives, and benefit the local economy by making it easier to walk, bike, and shop safely. The City of St. Petersburg is creating a Complete Streets plan this year, so now is the time to help more people walk safely in St. Pete!